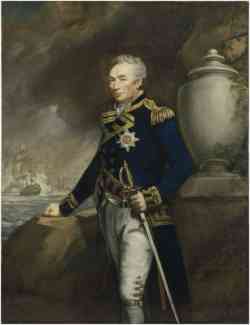 Admiral Sir Thomas Graves KB RN (1747 – 1814), admiral, third son of The Rev. John Graves of Castle Dawson, County Londonderry, by his wife Jane Hudson. He was a nephew of Admiral Samuel Graves and a first cousin once removed of Admiral Thomas, Lord Graves. Graves' three brothers all served as captains in the navy, becoming admirals on the superannuated list. Thomas entered the navy at a very early age, and served during the Seven Years' War with his uncle Samuel on board the H.M.S. Scorpion, Duke, and Venus. After the peace he was appointed to the H.M.S. Antelope with his cousin Thomas, whom he followed to the Edgar, and by whom, in 1765, while on the coast of Africa, he was promoted to be lieutenant of the Shannon. It is stated in Foster's ‘Peerage’ that he was born in 1752, a date incompatible with the facts of his known service: by the Regulations of the Navy he was bound to be twenty years old at the date of his promotion, and though the order was often grossly infringed, it is highly improbable that he was only thirteen: it may fairly be assumed that he was at least eighteen in 1765. In 1770 Graves was lieutenant of the H.M.S. Arethusa, and in 1773 was appointed to the Racehorse with Captain Phipps for the voyage of discovery in the Arctic Seas. In the following year he went out to North America with his uncle Samuel, and was appointed by him to command the Diana, one of the small schooners employed for the prevention of smuggling. She had thirty men, with an armament of four 2-pounders, and on 27 May 1775, being sent from Boston into the Charles River, was attacked by a large force of insurgents, whose numbers swelled till they reached a total of something like two thousand men, with two field-pieces. It fell calm, and towards midnight, as the tide ebbed, the Diana took the ground, and lay over on her side, when the colonial forces succeeded in setting her on fire, and the small crew, after a gallant defence, were compelled to abandon her, Graves having been first severely burnt, as well as his brother John, then a lieutenant of the Preston flagship, who had been sent in one of the Preston's boats to the Diana's support (BEATSON, Nav. and Mil. Mem. iv. 72). After this Graves continued to be employed in command of other tenders in the neighbourhood of Boston and Rhode Island till, on the recall of his uncle, he rejoined the Preston and returned to England; but was again sent out to the North American station in the same ship, commanded by Commodore Hotham. In 1779 he was promoted to the command of the sloop H.M.S. Savage on the West Indian and North American stations, and in May 1781 he was advanced to post rank. In the temporary absence of Commodore Edmund Affleck, he commanded the Bedford in the action of 5 Sept., off the Chesapeake (? Battle of the Chesapeake), and continuing afterwards in the Bedford, as Affleck's flag captain, was present in the engagement at St. Kitts on 26 January 1782, and in the actions to leeward of Dominica on 9 and 12 April, in which last the Bedford had a very distinguished part. In the following autumn Graves was appointed to the Magicienne frigate, in which, on 2 January 1783, he fought a very severe action with the French Sibylle, which was encumbered with a second ship's company which she was carrying to the Chesapeake. Both frigates were reduced to a wreck, and so parted; the Magicienne to get to Jamaica a fortnight later; the Sybille to be captured on 22 February 1783 by the Hussar [see Thomas McNamara Russell]. During the peace Graves spent much of his time in France, and in the early years of the French Revolutionary Wars had no employment. It was not till October 1800 that he was appointed to command the Cumberland of 74 guns, in the Channel fleet, under the orders of Lord St. Vincent. This was only for a few months; for on 1 January 1801 he was promoted to be Rear-Admiral of the White Squadron, and in March hoisted his flag on board the H.M.S. Polyphemus of 64 guns, one of the fleet proceeding to the Baltic with Sir Hyde Parker (1739–1807). Graves afterwards shifted his flag to the Defiance, and in her was second in command under Lord Nelson at the Battle of Copenhagen (1801), 2 April 1801. For his services on this important occasion he received the thanks of Parliament, and was nominated by the king a Knight of the Order of the Bath. Towards the end of July the fleet quit the Baltic, and on its return to England Graves, who had been in very bad health during the greater part of the campaign, retired from active service. The Foudroyant carried his flag in the Bay of Biscay from October 1804 to February 1805 (? Christopher Nesham). He became a vice-admiral on 9 November 1805, admiral on 2 August 1812, and died at his house near Honiton in 1814. He was twice married, but had only one daughter.